First, because the government is requiring teachers to work until they’re 68 or older. We believe that it is unreasonable to expect people in their 60s to carry on working at the level of intensity demanded of teachers. In Camden to date every classroom teacher has retired by their 63rd birthday. We want the government to cost our pension scheme and negotiate on that basis. Secondly, the government’s introduction of performance related pay has been done in a very unfair way. Michael Gove says it’s about ensuring good quality teaching but he also used the opportunity to scrap the national pay scale. When we asked him to issue guidance saying that schools should not withhold pay for budgetary reasons, he refused. Finally, the issue of teacher workload. The government’s own Teacher Diary Survey shows that primary teachers now work 60 hours a week on average and that secondary school teachers are working an average of fifty-five hours per week. This is well above the European Working Time Directive that no-one should be required to do more than 48 hours a week. This is an increase of 7.5 hours a week since Michael Gove took office. We believe these hours are incompatible with a family life and are driving people from the profession in ever greater numbers. Currently 40% of teachers leave in their first five years. We have asked the Department for Education to understand the causes of this workload and to work with us to reduce excessive workloads. These issues are what constitute the trade dispute, but it is also a fact that the constant denigration of state schools and teachers by Michael Gove is causing immense anger in the profession and part of the reason people are striking is because they want to make their feelings known. The NUT regrets calling this action, but has been left with no option after every attempt at dialogue has been thrown back in our face. Camden teachers are meeting outside BBC Broadcasting House corner of Duchess Street and Great Portland Street 11.30 AM for a march to Westminster Central Hall at 1.00 PM. Please join us if you can. 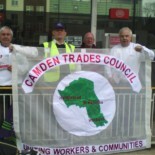 This entry was posted on March 25, 2014 by CAMDEN TRADES COUNCIL.